Dr. Massachi offers pre-operative clearance exams for patients in and around the Los Angeles, CA, area so they can feel confident about their surgery and their recovery afterward. As a skilled healthcare provider, Dr. Massachi is ready to answer your questions about your health and the benefits of your upcoming procedure. What is the purpose of the pre-operative clearance exam? The primary aim of the pre-operative exam is to make sure you're ready for surgery by evaluating your general health and your health in relationship to your surgery and recovery. It also will help identify any steps that need to be taken to get you in the best shape possible prior to surgery. Clinical studies have indicated that pre-operative exams can significantly reduce the risks of surgery and anesthesia as well as provide a speedier recovery. During the exam, you'll also have time to talk to Dr. Massachi about your concerns so you feel more confident about the procedure and its benefits. How far in advance should I schedule my exam? In most cases, your pre-operative exam will be scheduled within two to four weeks of your surgery. This enables Dr. Massachi to provide your surgeon with the most current information about your health while also leaving plenty of time for lab work or other tests to ensure you're in the best health possible. Your surgeon will be able to provide you with a timeline for scheduling your pre-operative exam. What's involved in a pre-operative clearance exam? Your pre-operative exam will follow the same pattern as your annual physical exam, checking your vital signs like your blood pressure and pulse and listening to your heart and lungs. However, the nature of a pre-operative exam differs from a regular physical because it focuses primarily on your health in relation to the surgery you'll be having. That means it will be more focused on determining any potential risk factors and identifying additional tests or steps that should be taken to ensure your surgery and recovery are as successful and risk-free as possible. "Dr. Massachi is not only intelligent but I find him to be interested in all that I have to say. He puts all his patients above all & has the best intentions." "Dr. Massachi is lovely, very attentive and thorough. He's a good listener and has a manner that makes you feel you are in good hands." "Dr. Massachi is really one of a kind. He is an extremely personable doctor and one of the greatest doctor's I've ever become treated by." 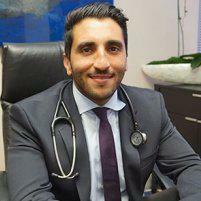 "Doctor Massachi was truly very knowledgeable and kind, he really listened to me and his advice was right on the ball." "I am more than happy to give him 5 stars. This is mainly because of his bedside manner and his willingness to communicate with patients."